Description of fields used when entering or importing archival descriptions using DC in a CSV file or entering the data manually. At present, there is no DC-based CSV template for importing descriptions into AtoM. However, because AtoM was originally based on the ICA’s ISAD(G) standard (see: ISAD), the ISAD CSV template can be used for import, as all templates have been crosswalked in AtoM where possible. To test this, we recommend creating a full DC description in AtoM, and then changing the display template to DC, to determine where field in DC map to ISAD. For more information on changing the display template for a description, see: Change the display standard. If desired, all templates in AtoM can be changed at the same time using the Default template setting available in Admin > Settings - see Default templates. The CSV mappings below will provide guidance on which ISAD CSV fields can be used to import your DC-based descriptions into AtoM. AtoM implements unqualified Dublin Core Metadata Element Set, Version 1.1, which is maintained by the Dublin Core Metadata Initiative. DC Rule refers to the rule from the applicable standard and/or the instructions provided by AtoM. 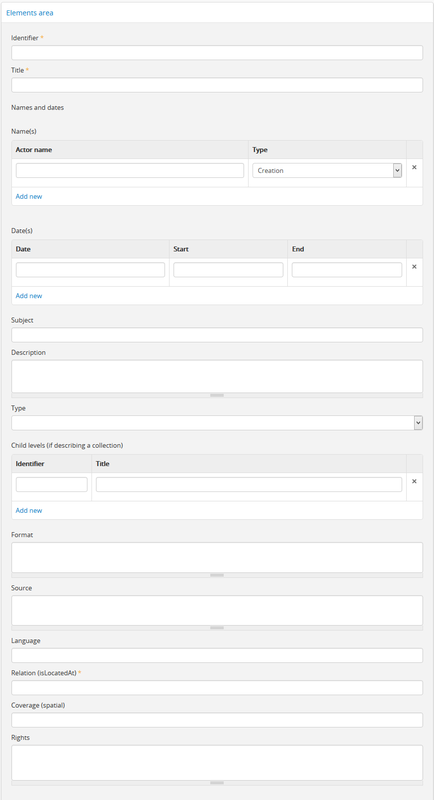 The data entry fields for the Dublin Core archival description edit template. An administrator can set the reference code to inherit from higher levels of description via Admin > Settings - see: Inherit reference code (information object) for more information. However, since DC simple records are not designed for hierarchical information, engaging this setting will not change how the identifier is handled during export - only the identifier for the current level of description will be exported. AtoM will use the title of a description to generate a slug used in the permanent URL for the resource. For more information, see: Notes on slugs in AtoM. creators - Creator name(s) - multiple names can be entered, and separated by the | pipe character. In the “Actor name” field enter the first few letters of the the actor’s name. A list of names will appear in the drop-down menu (generated from the names of existing authority records). If the name does not appear in the menu, type the name and a new authority record will be created. You can leave the “Actor name” field blank. Lower levels inherit creator information from higher levels: use only if the creator is different at the lower and higher levels. At the highest level of description, you should always include the creator. Select the type of event from the drop-down menu: creation, contribution or publication. The value list is drawn from the event types taxonomy and can be edited by an administrator or editor. For more information, see: Terms. creationDates - display date for creation events (what the public users will see in the view page). creationDatesStart - start date - ISO-formatted (YYYY-MM-DD). Not visible to public users. creationDatesEnd - end date - ISO-formatted (YYYY-MM-DD). Not visible to public users. The CSV columns in earlier versions prior to 2.2 was named creatorDates, creatorDatesStart, and creatorDatesEnd - they have been updated to clarify the relation to the creation event - not to the dates of existence of the creator. However, we have added fallback code, so if the old names are used, the import will still succeed. If desired, enter the date range as you want it to appear in view mode in “Date”. Add any additional text to qualify date range (e.g. “ca. 1940-1980” or “-1980, predominant 1973-1980”). Enter the Start and End dates. Do not use any qualifiers here (e.g. “ca.”) or typographical symbols (e.g. “[194? ]”) to express uncertainty. If the start and end years are the same, enter data only in the “Start” field and leave the “End date” blank. These values should be ISO-formatted - acceptable formats include: YYYY, YYYY-MM, YYYY-MM-DD, or YYYYMMDD. These fields only display while editing the description. If AtoM is able to interpret the start and end date from the value entered into the Date field, it will autopopulate upon entering - but you can still edit the auto-populated values as needed. Complete at lower levels of description even if you are leaving the creator name field blank (e.g. when describing a series, you do not need to repeat the creator name from the fonds description, but you do need to enter the date range of the series). Whereas “Start” and “End” are used internally for database searching and sorting purposes, the “Date” field is for display purposes. However, if you do not enter anything into “Date” the “Start” and “End date” will appear as a date range when the record is saved. You can add multiple dates as needed. Click the “Add new” hyperlink to add another date row. Click on the “Subject” field and enter the first few letters of the term. If the subject term does not appear on the list, type it in and a new subject term will be created. You can add multiple subjects, as desired. As you exit the field, AtoM will automatically add a new field below. If you wish to remove an access point, hover your cursor over the bullet point next to the term - it will transform into an “X”. You can click the X to remove the term. Notes: You can click and drag the bottom of the field to expand it, in case you are writing a long description and require more room. This element will map to Scope and Content in equivalent archival standards such as RAD, DACS, and ISAD(G). DC Rule: “The nature or genre of the resource. Recommended best practice is to use a controlled vocabulary such as the DCMI Type Vocabulary [DCMITYPE]. To describe the file format, physical medium, or dimensions of the resource, use the Format element.” For more information on the Dublin Core type taxonomy, see http://dublincore.org/documents/dcmi-type-vocabulary/. Select a value from the drop-down menu. The values are drawn from the “Dublin Core Types” taxonomy. AtoM comes with the DCMI TYPE terms prepopulated in the taxonomy. Users with the proper edit permissions can edit or delete terms, or add new ones - however, to remain compliant, we recommend using the supplied values. You can add multiple values as needed - they will appear above the drop-down menu as you select them. To remove a value, simply click on it - AtoM will remove the term. See Identifier and Title, above, for more information on the use of each field. Dublin Core simple XML is not designed for hierarchical description. Exporting DC XML in AtoM from the parent record (or top level of description, such as a collection with many items), will not include child descriptions in the DC XML generated as you would normally find in the EAD XML, for example. If you require hierarchical XML, consider using either the EAD XML, or flip the template to MODS and use the MODS XML export - in MODS, each record is exported individually, but the XML will contain links referencing parent and/or child descriptions. To change the display template, see: Change the display standard. If the resource you are currently describing is already linked to a digital object, the Internet Media Types (MIME) will be added automatically upon output. It is recommended that you avoid duplicating those values here. Notes: This field crosswalks from Extent and medium in the ISAD template, Extent in the DACS, and Physical description in the RAD template. Notes: This field crosswalks from Existence and location of originals in the ISAD and DACS templates, and Locations of originals in the RAD template. Click on the field and begin to enter the first few letters of the target language. A drop-down menu will appear with matching results from a controlled list of ISO languages (pre-loaded in AtoM) as you type. When you see the matching language in the drop-down, click on it - AtoM will add the selection above the drop-down menu. You can do this as many times as you like to enter multiple languages. To remove a selection, hover your cursor over the term - the bullet next to the language will change into an X. Click on the term to remove it. This field is used for indicating which archival institution (i.e. repository) holds the record(s) being described. Select an archival institution only at the highest level of description; leave this field blank at the lower levels if they are all held by the same institution. To improve the description workflow and to respect the convention in most archival standards not to repeat information at lower levels, AtoM will inherit the name of the repository from the highest level of description, unless a different repository is explicitly added. Click on the Relation (isLocatedAt) field and type the first few letters of the archival institution that holds the archival material being described. The names are drawn from pre-existing archival institution records. If the name of the institution does not appear in this list, you can type it in and a new archival institution record will be created. If you are not careful, it is easy to accidentally create duplicate repositories! To avoid duplication, matching terms must be selected from the auto-complete drop-down - otherwise, even exact matches will create duplicates when the user presses enter. Click on the “Coverage (spatial)” field and type the first few letters of the place. If the place term does not appear on the list, type it in and a new place term will be created (note that this works only if you have taxonomy edit permission). This field maps to “Conditions governing access” in the ISAD and DACS templates, “Restrictions on access” in the RAD template, and “Access condition” in the MODS template.